Have you ever tasted Vietnamese iced coffee (cà phê sữa đá)? If not, just try a cup, you’ll feel a wonderful savor, which quite different from other popular flavored coffees like Hazelnut, Latte, Cappuccino, etc. With condensed and high caffeine content, Vietnamese iced coffee has more authentic, subtle, and charming taste than instant coffee or what is brewed by automatic makers, or filtered by paper. Due to its strong flavor, we don’t drink coffee in a big cup like Western style. Rather, we enjoy small sip by sip. It’s great to feel the bitter and distinct aroma of coffee, fragrance of caramel, together with the sweet creamy delight of milk in cold ice. Altogether, it makes a fabulous quintessentially Vietnamese beverage, especially in a hot summer day. Yet, for those of you who’re not familiar with this Vietnamese drink, you may get hard to sleep. So, in your first trial, don’t drink too much. You can order iced coffee almost everywhere in Vietnam’s cities and towns. It’s perhaps correct when somebody say Vietnam is a country of food-lovers and total coffee addicts. In big city like Ho Chi Minh, coffee shops are everywhere, including small shops on pavement. So if you want to try Vietnamese style, I think you’d better to go to Trung Nguyen coffee store. 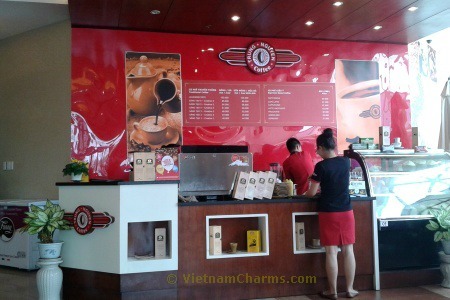 They’re successful to have coffee shop chain over Saigon and other cities. You can find a cup with standard, rich, and aromatic coffee served. How to make Vietnamese iced coffee? Please note that Café sua da is not “fast-food”, thus absolutely not for the rushy-rushy. You cannot get one via drive-thru, or brew it with automatic coffee makers. Somebody consider preparing themselves a cup of iced coffee in the morning a kind of ritual, and need to pass methodical steps. I list here such main steps that I follow to make coffee for myself, only sometimes though because I prefer go to enjoy in coffee shops with my friends, partners, or somebody else. Dark-roast ground coffee. You can buy a bag of popular Vietnamese coffee brands like Trung Nguyen, Vinacafe, Me Trang, etc. I read on internet that, in case you cannot have Vietnam coffee, then you can use Cafe du Monde with Chicory instead. I’ve never had to do that way though because I’m living in Vietnam :). 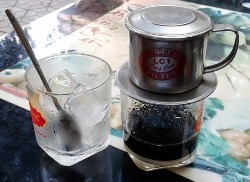 A clean filter (phin), which has four parts: bottom filter, cup, press, and lid (More about Vietnamese coffee maker). You’d better use inox or stainless steel rather than aluminum filter. The later makes your coffee taste a little bitterer. A cup or mug that you can put the filter on. You should adjust quantity ratio of coffee and milk to suit your preferences, bur remember this milk is very sweet. Generally about 2-4 teaspoons is enough. If you prefer sugar to milk, just pass over this step, since sugar should be added in a later step. Put 2 tablespoons of coffee grounds into the cup or mug, moisture it with a couple tablespoons of hot water. Put the press on the coffee top; use your finger to push a little hard on the press. Some filter has screw to help adjust force on coffee grounds layer. Twist the metal insert to pack down the grounds. 4. Pour boiling water into the cup to nearly full level. If you see coffee liquid dripping too fast, then screw clockwise a round, and vice versa. Proper rate is about a few drops per second. 5. Place the lid on to keep it hot. 6. Wait patiently for coffee liquid dripping all down, it’s about 5-10 minute. Remember, the slower the dripping, the stronger the coffee. Pour the mixed into the ice filled glass, and your Vietnamese coffee is ready to serve. Above are steps to make iced coffee. In the cold days in the North Vietnam, it’s not comfortable to drink coffee with ice. In that time, I prefer a cup of warm coffee. Instead of a glass of ice, coffee shop will put the cup in to a bowl of hot water, which will keep the coffee cup warm longer for my savoring. For visual illustration, you can watch a video about making Vietnamese iced coffee on Vimeo.com (open in a new window). Note: to buy truly authentic Vietnamese iced coffee, you should go to Vietnamese grocery store and pick up Trung Nguyen pre-ground coffee, Ong Tho condensed milk, and Vietnamese coffee phin. You can also buy Vietname coffee bag, filter, and condensed milk on Amazon.com. If you travel to Vietnam, do not miss the chance to try this special drink. Then if you enjoy, share your thinking with me and other visitors. We’d love and look forward to your story. P.S. you can drink coffee listening to a beautiful song Sài Gòn cà phê sữa đá (Sai Gon iced coffee) in Vietnamese. Also, if you find useful information in this article, would you mind encouraging me with a Like button? Thank you!